The name of Perth base HMAS Stirling was selected to honour the name of Captain James Stirling, Royal Navy, the naval officer who landed on Garden Island in 1827 and returned in June, 1829 to found not only the first European settlement in Western Australia, but also the first free colony anywhere in Australia. Stirling's makeshift camp was set up on the craggy rock outcrop on the eastern side of the island, which today is known as Cliff Head and is the site of a memorial. Stirling's crest is based on the Stirling family coat-of-arms. The planning of Stirling began in 1969 after the tabling of a feasibility study into the use of Garden Island as a naval base. The 4.2 kilometre causeway linking the island with the mainland was completed in June 1973. Construction of Stirling's wharves and workshops began in early 1973 and accommodation in 1975 with Stirling being formally commissioned on July 28, 1978. The fragility of Garden Island and its environment had been recognised and some 50,000 indigenous trees and scrubs were planted to stabilise the soil and enhance the wildlife's habitat. Since its commissioning on 28 July 1978 Stirling has expanded enormously within its existing boundaries and has seen building such as the Submarine Escape Training Facility - one of only six in the world and the only one in the southern hemisphere constructed. Some 12 Fleet units including RAN’s Anzac Class frigates and Collins Class submarines are stationed here, along with some 70 units including the Submarine Training and Systems Centre (STSC), AUSCDT Four and the Defence Communications Station (DEFCOMMSTA) Perth. 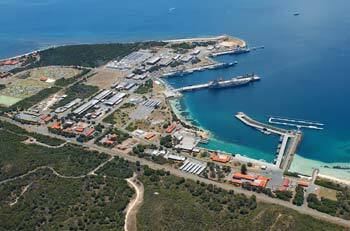 The 314 metre long two level Diamantina Pier and the redeveloped small ships harbour have vastly increased the wharf and berthing space available to surface ships and submarines at Stirling. Other major additions have been the helicopter support facility located on the southern end of Garden Island, extensions to the RAN Submarine Training and Systems Centre, the Training Centre - West complex and a trials, research and support facility. HMAS Stirling's primary purpose is to provide operational and logistics support to the RAN ships, submarines and aircraft based in WA. You are welcome on tranquil Garden Island, but you must travel by private boat and leave before nightfall. The main attractions of Garden Island are its peaceful white beaches, foreshores and bays. Here visitors can picnic, swim, fish, surf and sail. Approximately two-thirds of this Commonwealth owned island is open to the public in daylight hours with Department of Conservation and Land Management Rangers patrolling the coastline and providing assistance to visitors. The extraordinary thing about Garden Island is that the environment you can see still remains much as it was before European settlement. Garden Island remains a piece of living history with which other areas can be compared. Garden Island is covered with dense communities of Rottnest cypress, Rottnest tea tree and honey myrtle. Some parts are forested, and others have impenetrable thickets of coastal scrub. These areas are home to many birds and the rare tammar wallaby. The sandy soils of the island are porous and the vegetation so dense that there are no wetlands. Because there are no introduced pest and no rubbish, Garden Island is free of the disease salmonella. The aim is to keep it that way. The east coast is usually protected from bad weather and therefore safe for small craft except during stormy conditions. You can surf on the more exposed west coast, but be careful. If you wish to cross the island to take advantage of the surf and the better fishing, you may do so by foot, provided you stay on the paths. Please do not leave the paths as the scrub is thick, prickly and abounds with highly venomous tiger snakes. Visitors are invited to inspect the site of Captain Stirling's first settlement at Cliff Head. The original well is visible and a memorial and lookout has been established there. For safety and security reasons, the public are prohibited to enter Closed Naval Waters surrounding the Armaments Wharf and Careening Bay. Similarly, operational precincts on Garden Island, obvious by their surrounding fences or signage, are prohibited to unauthorised public visitors.